ARC provided by Ace Books in exchange for an honest review. 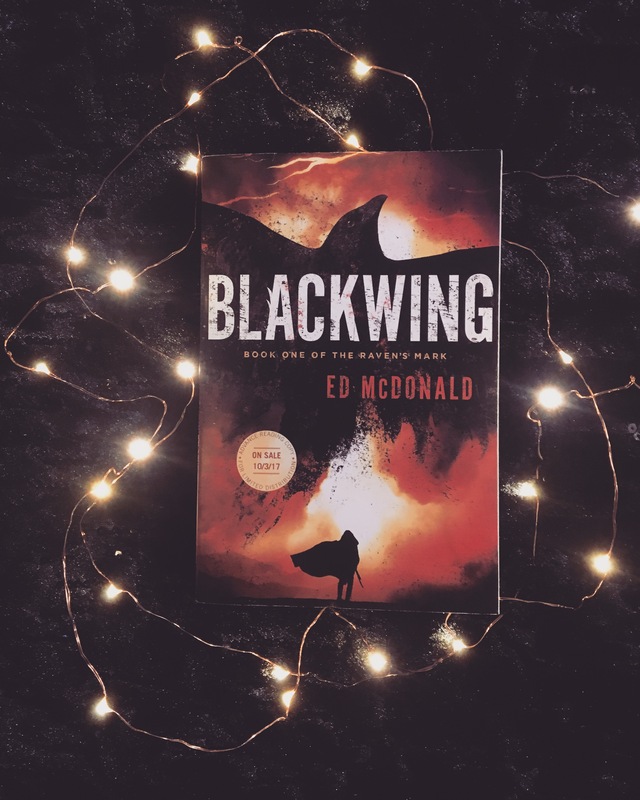 2017 appears to just be the year for amazing debut fantasy novels, and Blackwing by Ed McDonald was no exception. This book is already released in Europe, but doesn’t drop for us Americans until October 3rd, but you definitely want to put this on your pre-order list if you’re a fantasy fan. Blackwing is a super unique novel that isn’t afraid to talk about dark themes. I never felt like Blackwing was too much, but you should probably know going in that many people do consider this grimdark. Also, trigger warnings for suicide, war themes, and graphic violence. But, again, I don’t think it’s anything too brutal, and I never felt overwhelmed by any of the dark themes. This is a post apocalyptic story following a bounty hunter, Ryhalt Galharrow, AKA: Blackwing, who is constantly running away from his past. He also has a very magical arrangement with a Nameless, which aren’t Gods, but they are pretty close to it. This arrangement is also constantly haunting him, because he never knows when he will be called upon for a quest. Well, that’s how this story truly gets started, and Blackwing receives a quest that not only seems impossible, but also forces him to look his past straight in the face. Blackwing is quickly tangled up into a a much bigger mission where the fate of human existence depends on him helping solve a problem that seems unsolvable. Basically, the humans live in fear of the Dhojaran forces and the Darlings, who were once human and now turned into magical beings by the Deep Kings. All of these forces live in the Misery alongside ghosts and other magical, yet terrifying, beings. There are now outposts where soldiers are constantly on the lookout for the Deep Kings and their armies. Many years ago, the Deep Kings tried to take over the rest of human existence, but a magical weapon unleashed a fury like no other, and now its presence keeps the humans feeling safe and the Deep Kings feeling weary to try another attack. That is, until there is talk circulating that the weapon may not be in function anymore. In this world, some humans are Spinners, who are like sorcerers and able to make Phos from the powers of the three moons, which help them produce magic. Talents are a lesser type of sorcerer, who are still able to produce Phos, but for Spinners and others to use. And the magic that the Spinners and Talents use is always at a cost. Many go mad, and are killed or tucked away in asylums. Talents are also treated terribly and forced to work at mills, where they are just harvested for their Pho production. These moons also play a huge part in this book, because of the Spinners and Talents that are drawing power from them, but I predict these moons will play an even bigger part in this world and story in later installments. ➽Crowfoot – Has the pact with Blackwing. ➽Nall – Vanished. Also, made the powerful weapon that keeps the Deep Kings at bay. ➽Shallowgrave – Vanished and is a complete mystery. ➽The Lady of Waves – Never seems to leave the island of Pyre. But, like, I am so in love with the mystery about this Nameless. I’d love to read an entire book just about her and what is going on on her island. I loved the mystery behind all the Nameless, and I cannot wait to read more books in this series just to find out all of their secrets. It is also pretty apparent that they are going to play a much bigger role in this series, and I’m completely ready to learn any and everything about them. Also, give me all the information on Saravor, the Fixer, because I’m already obsessed with his entire situation. This story is action packed and moves so very fast that the book feels impossible to put down. Like I said above, the world is so unique and has such a Mad Max feels to it. I completely adored it all, and the characters are just as amazing, too. Plus, the prose of this novel, especially in juxtaposition of this cruel world, is absolutely beautiful. I was so impressed with the writing in this, and I couldn’t believe all the quotes I had tabbed once I finished. Not only is this a fast paced thrilling story, but it’s written absolutely lyrically. And this book is so funny. It’s hard to make me actually laugh in a book, but this book actually made my sides hurt at times. The banter is just the perfect combination of witty and humorous, that is very reminiscent of Sebastien de Castell’s Greatcoats, especially during many of the fighting scenes. And if you’ve been following my reviews for a while now you will know that comparing anything to Sebastien de Castell means that I love it completely. This book also excelled in female representation. The two strongest fighters on the good side of this war are both women. Woman are soldiers, Princes, and godlike deities in this world. They are all strong, brave, and rather fearless if I do say so myself. The female representation in Blackwing is amazingly portrayed. And Ed McDonald even gives us a little sexual representation, because there is also a gay side character that I instantly fell completely in love with. It was said, known, and accepted that he was gay without question or contestation. And the entire society that is built in this book feels very gender neutral and I was completely living for it. Also, the main female character has severe scarring all over her body, and I was living for the body positive representation that Ed McDonald wrote. Like, he did what Colleen Hoover in November 9 could not, and he did it seamlessly and completely beautifully. And seeing things like that in Fantasy? Rare and beautiful and I completely applaud this debut author for incorporating all of these amazing and important themes. Seriously, Blackwing has it all, and I’m still in somewhat disbelief that this is Ed McDonald’s debut novel. I also expect nothing but great things for everything else he has in store for us surround this world. The plot is unique, the world building is incredible, the characters are fantastic, the representation is important, and the writing is nothing short of gorgeous. Blackwing is a must read in 2017 for Fantasy lovers, and I promise you won’t be disappointed. Well, this just sounds amazing. I have had my eye on it for a while now. Just have so many series that I need to start/finish. Just going by the couple reviews I’ve read, I know I’m going to love it. Been too busy recently to get any reading time. It’s been painful. I don’t really know why, but this reminds me of And I Darken. 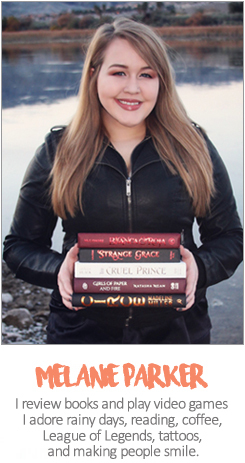 It sounds like a lot of YA tropes aren’t used in favor of plot convenience. “Also, the main female character has severe scarring all over her body,” THANK YOU!!! Books and etc only seem to talk about scarred dudes and how attractive it makes them and their love interest is this is beautiful, physically perfect woman. It always made me think that this was really damaging to women who happen to have scars or etc. since they’re never the heroine and they’re never the love interest. It sort of does have an And I Darken vibe, actually. But this is more… magical? But totally a good comparison, love! Awesome, I’m really hyped about the magic in it!